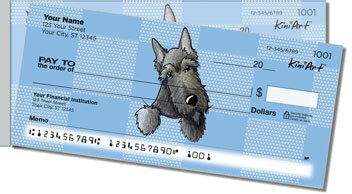 Though Scottish terriers look a bit odd, they're loveable, dignified, and great pets. You probably know where they came from and can recognize them on site, but can you answer these questions about the? 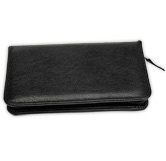 Q: Where was the first Scottish Terrier club established? A: It was actually established in Endland in the 1880's, not Scotland. 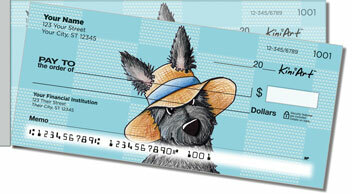 Q: Who brought Scotties to the U.S. and when? A: John Naylor brought the first Scotties to the U.S. in 1860. Q: What other U.S. president besides FDR owned Scottish Terriers? A: Presidents Dwight Eisenhower, Ronald Regan, and George W. Bush all own Scottish terriers. How'd you do? Get 1 out of 3 at least? 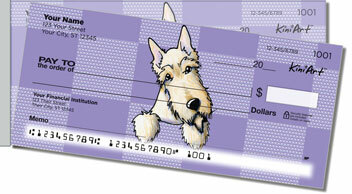 No matter how you did, you're sure to love the Scottish Terriers on our checks designed by Artist Kim Niles of KiniArt. Made with colored pencil and India ink, these lovable mutts are just waiting for someone to take them home. Will that person be you? 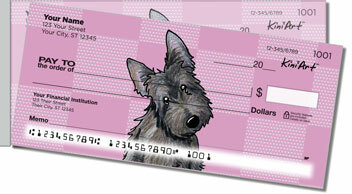 Order these cute Scottie checks today and get shipping absolutely free!